"Casey's one-over par 72 might not sound like a terrific round of golf but with the wind up and the course far drier than it had been over the first few days, conditions were really tough. Nobody bettered 68 and Casey played brilliantly. He deserves much credit." At the Valspar Championship, world no.1 Dustin Johnson was a warm favourite to overturn a one stroke deficit with a round to go but he failed to birdie the gettable par five first and was never at the races after that, eventually beaten by three by third round leader and defending champ, Paul Casey. It was the first time DJ had failed to make a single birdie in a PGA Tour event since he threw away a six-stroke lead in the final round of the WGC-Champions in China in 2017. DJ hit a low of [2.14] in-running, Louis Oosthuizen was matched at only [3.0] on the back-nine and after Casey had three-putted the 17th to drop back in to a tie with Jason Kokrak, the 33-year-old Canadian-born American hit a low of [1.9], but having been given a chance to finally win his first PGA Tour title, he fluffed his lines completely and bogeyed the 72nd hole. I suspect Casey was helped by how poor the world number one played alongside him, and when he bogeyed the 17th (his fifth bogey of the day) and drove in to the church pew bunkers right of the fairway on 18, it did look that we might witness yet another Casey fold, but to his credit, he played a brilliant approach from the bunker to win by a stroke, despite shooting a one-over-par final round. That might not sound like a terrific round of golf but with the wind up and the course far drier than it had been over the first few days, conditions were really tough. Nobody bettered 68 and Casey played brilliantly. He deserves much credit. 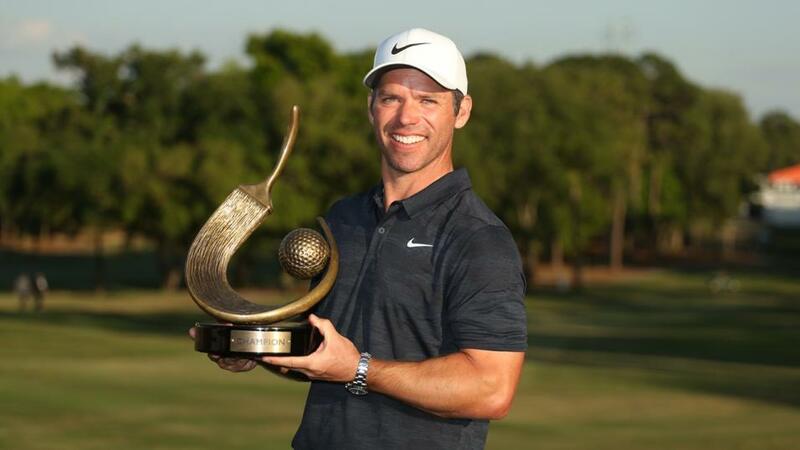 Following Francesco Molinari's win at Bay Hill and Rory McIlroy's victory at Sawgrass, Casey became the third European Tour winner in-a-row on the PGA Tour. The 41-year-old Englishman was a [34.0] chance before the off, having been matched at a maximum of [42.0]. Pre-event [220.0] chance, Scott Hend, who was matched at high of [310.0] before the off, looked in complete control with three to play but a birdie by pre-event [120.0] shot, Nacho Elvira (matched at a high of [220.0]), at 16 closed the gap to one and after both had parred the 17th, it was all to play for on the par five 18th. We looked like getting a dramatic finish as it was but just as the final group teed off at the 72nd hole, the heavens opened. Hend was forced to lay up after his drive and Elvira's second finished just shy of the green. It looked like the Spaniard had a decent chance to tie Hend when the Aussie's third finished outside legitimate birdie range but with torrential rain falling, thunder cracked on his backswing as he played the chip and as result, he was left with even further to go than Hend for birdie. Immediately after the unfortunate chip, play was halted. The weather front moved away as fast as it had moved in and with Hend trading at around [1.15], it looked likely that we were returning to the fray to witness a straightforward two-putt par for victory but Nacho was having none of it. Hend two-putted for par and we were into extra-time. The market felt momentum was with the Spaniard and Hend was trading back out at odds-against, having been matched at a low of [1.02]. The playoff was a very straightforward affair. Hend clipped the trees off the tee but found the fairway and he again hit the trees with his approach, which finished up in a greenside bunker, from where he got up-and-down for a birdie four and the title. It hasn't been a great week and Hend feels like one that I may have snared although his tweet before the off completely put me off! Did he really lose six balls!? I backed Dustin Johnson before round four and I backed him again in-running at [10.0] but I layed that backed at [5.0] so all I really did was boost the price. Not that it did me any good. Obviously, I'm disappointed with the outcome but had I known this time yesterday that a round of 70 would have won him the title I'd have had considerably more on than I did! DJ had shot 14 rounds in the 60s in-a-row before yesterday's three-over-par 74 so the poor showing really did come out of nowhere and I'm happy to move on. The link between the Crans and the Palm Course at Saujana Golf and Country Club, explored in the preview, has been boosted further and Hend feels like one that got away given his humongous pre-event price. Hend finished runner-up at Crans in both 2016 and 2017 and the runner-up, Elvira, finished fourth there in September. Over in Florida, Casey was the first to defend the Valspar but the third to win the title twice in just 19 years and the runner-up, Kokrak, who rarely contends anywhere, was finishing inside the top-eight for a third time at Copperhead so it's a venue where course form counts for plenty. As already mentioned, Casey was the third European player to win in three consecutive weeks and the last time that happened was seven years ago, also in Florida. The windy, tough conditions in the Sunshine State seem to suit the Europeans, where quite a number are based anyway. Is Elvira the Unluckiest Player on Tour? Wang holed from 18 feet to get into the playoff, from 50 feet at the first extra hole to stay alive and from 20 feet to take the title! With just the smallest twists of fate Elvira could have already bagged a couple of titles and he most certainly deserves at least one. Hopefully it won't be long before he gets off the mark. That's more than enough looking back given we have three events to look forward to and that one of them, the WGC-Match Play, starts on Wednesday. I'll try and get that preview out later today and the Indian Open and the Corales Puntacana R & C Championship previews will follow on tomorrow.